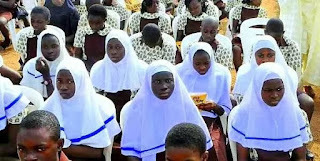 No fewer than 25 Muslim clerics in Osun State monday morning besieged St. Charles High School in Osogbo and Ife Oluwa Middle School to enforce the court ruling on the adornment of the hijab by female Muslim students in schools in the state. The clerics went to the schools around 8 am to enforce the court order. Consequently, the principal of St. Charles High School, Mr. Anthony Famoriyo, reportedly informed them that he could not fulfill their request because he was yet to be directed by the Ministry of Education on the hijab ruling. Famoriyo, when contacted by journalists, said he told them that no teacher would prevent any student from wearing the hijab the moment they received such directive from the state government. When ThisDay visited the school, some students of the school were engaged in calisthenic training. Also some Islamic followers were seen forcefully enforcing the use of the hijab on those identified to be Muslim girls in the school, while some of them were prevented from entering the school because they did not adorn the hijab. Owing to the melee caused by the clerics, academic activities in the school were disrupted as the group also stormed classrooms to stop the teachers on duty. However as the controversy over the hijab ruling raged in the state, Governor Rauf Aregbesola for the first time spoke on the crisis, stating that neither himself nor his government ordered the use of the hijab by female Muslim students in public schools in the state. Aregbesola stated this yesterday at the roundtable on Development Collaborative Framework for Education Development and Advancement organised by the Development and Advancement in Western Nigeria (DAWN) in Osogbo, the state capital. Aregbesola challenged those who had accused him of ordering the use of the hijab by Muslims schoolgirls to produce concrete evidence to substantiate their claims. The governor also challenged those accusing him of plunging the state into a religious crisis to present a video or voice recording, written speech evidencing where he commanded or ordered female Muslim students to wear the hijab with their uniforms. He averred that all programmes introduced into the state’s education rebranding were the resolutions that came out of the education summit organised by his administration shortly after coming into office. Aregbesola noted that the resolution of the summit, headed by Nobel laureate, Professor Wole Soyinka, never considered nor recommended any religion. According to him, “There is nothing religious in any of our policies. The facts on the ground contradict the claims by the opposition. The choice of my deputy governor tells it all, I knew she is a Pentecostal Christian of the highest order before I picked her. “Everything we have done in the line of education is in line with the resolution of our education summit. “Against all speculations, I have not ordered the use of the hijab, I challenge anybody with evidence to come out and show that I have made a proclamation on the hijab.